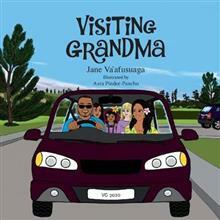 A children's picture book about a Samoan family set in New Zealand from the perspective of a pakeha girl. A normal event in one culture may seem odd to another culture. But when pakeha Rachel goes with her new Samoan friend Luisa to visit her grandmother, it's not quite what Rach... read full description below. A children's picture book about a Samoan family set in New Zealand from the perspective of a pakeha girl. A normal event in one culture may seem odd to another culture. But when pakeha Rachel goes with her new Samoan friend Luisa to visit her grandmother, it's not quite what Rachel expects. Jane Va'afusuaga was born and raised in Eastbourne, Wellington and is of Scottish heritage. Having trained as a teacher, Jane taught for 10 years in Auckland and four years in Apia, Samoa. Jane lives in Samoa in the village of Falease'ela, with her husband, Olsen and daughter, Coco. Azra Pancho-Pinder is an Auckland based illustrator who has worked as a visual artist in the Phillipines and New Zealand. Well known in the Phillipines as one half of the Pinder Twins, Azra and her identical sister Sam inherited their creative skills from their artist parents.